While the rest of the northern hemisphere is currently going through a beautiful hot summer, in Singapore I'm starting to see heaps of cherries and other warm weather berries piling up makeshift counters at the supermarkets. These in-season imports are now fresh, juicy and plump, some of them even going on discounts at selected outlets. Before leaving for my business trip, I managed to lug home punnets of raspberries, blueberries and blackberries, plus a few kilos of red cherries. Adding to that, my favorite lychees from China are also at their height, so baskets of these without fail went into my groceries as long as I could handle the weight. I was in one of those get-it-while-the-going's-good shopping mode, not really knowing what to do with almost half a fridge full of summer berries and stone fruits. 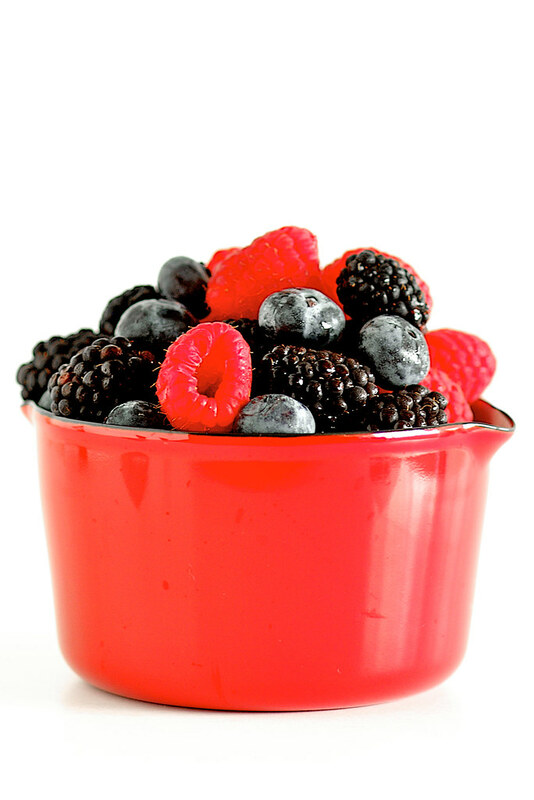 After going through the cherries and lychees I was on the verge of coming down with a sore throat, so I studied the punnets of berries briefly, popped my ice cream maker bowl into the freezer and began to imagine having scoops of frozen berry smoothness slide down my protesting thorax. Who needs an excuse for ice cream, really? This batch of ice cream brought me several revelations though. Firstly, I now know when exactly a nappe consistency would be achieved. As I sweated myself in my 38 degrees kitchen while my air-conditioning servicing guy did his magic with our ailing units, I remembered a recent pastry class I attended in Hong Kong where the chef told us to look out for that moment when the bubbles start to disappear from the custard. The second - I'm giving up on my KitchenAid ice cream attachment, after giving it another chance to redeem itself from its previous disappointment. It's pretty much useless in my kitchen unless I act on the third matter-of-fact confirmed by my jolly A/C man - yes, people do install air-conditioning in theirs. But, alas, it's not possible for us. Not in our rental HDB with a single compressor restriction, unless we'd be willing to replace all the other three units. That pretty much sealed my final ice cream making fate - I'd always end up with photos of melting ice cream for you. This was by far the best ice cream I've made, texture wise, scooping out easily straight out of the freezer. Even Vijay - an absolutely non-berry kind of guy, who'd only eat this as long as it had no sign of berry pulp (hence my strained puree) - concurred between spoonfuls of the purplish pink delight. Hopefully there'll still be some left when I get home this weekend. Two weeks of room service Häagen-Dazs and Mövenpick here in Shanghai made me miss my scoops of homemade ice cream more than ever. Now, onto more serious business, since I'm now in the market for a proper ice cream machine, do let me know if you have recommendations for models available in Singapore and experiences with it in our year long wrath-of-God weather. Adapted from David Lebovitz's The Perfect Scoop. Note: Depending on the tartness and ratio of your mixed berries (blueberries are really sweet, blackberries the most sour), adjust the sugar accordingly but I wouldn't reduce more than half a cup. 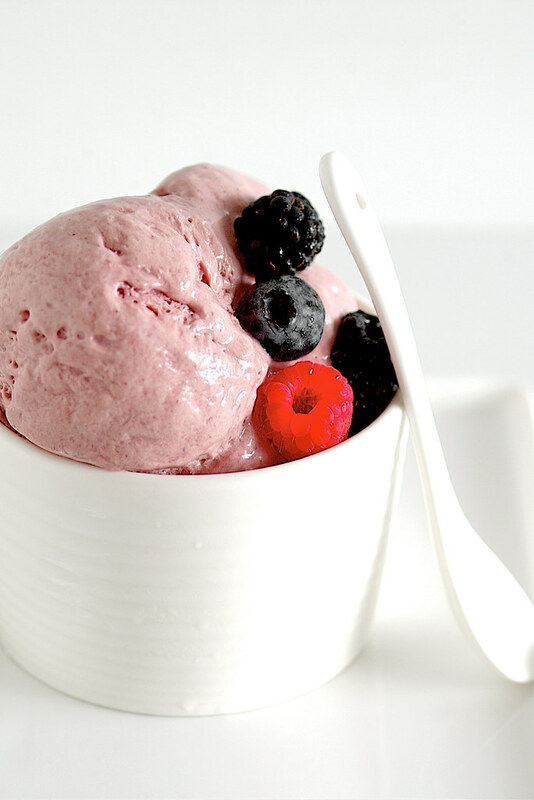 You may also experiment with less egg yolks, regular milk and whipping cream if a healthier version rocks your boat and you still want ice cream instead of sorbet. In a saucepan, combine the milk and sugar. Heat the mixture gently over medium low heat to the point of just below boiling. Meanwhile, measure out the heavy cream into a large bowl and set a fine mesh strainer over it. Remove warm milk from heat. In another medium bowl, whisk the egg yolks and vanilla. Slowly pour the warm milk into the egg yolks, whisking constantly. Return the mixture back into the saucepan. Over medium low heat, continue stirring the custard constantly with a wooden spoon, scraping the sides and bottom of the pan. The custard is done when it reaches nappe consistency, coating the back of the spoon. Immediately pour through the strainer over the heavy cream. Stir until combined. Add in the mixed berry puree and the lemon juice. Stir until completely cooled over an ice bath. Cover and thoroughly chill in the refrigerator - for at least 6 hours, preferably over night. Churn in your ice cream maker according to manufacturer’s directions or use the instructions here to churn without a machine. Freeze completely before serving. Love love the last photo ! Check out Tott at Dunearn Road - I think they a couple there. Shirley: Thanks, I will. That'll be on my priority list of things to do before the next trip. we don't have an AC unit in our kitchen, the only unit is in the bedroom and the last time we made frozen yogurt, we set up shop in the bedroom, with the AC cranked. it was weird sitting on the bed while the machine churned but it was also really amusing. Lan: My KA bowl thaws in about 20 minutes in out of the freezer, the ice cream could never reach that soft serve consistency, more like just a lighter and fluffier custard. I had to churn it manually at least 2-3 times after that. This looks delicious. I love berry ice creams. I have no idea if it would be available in Singapore but mum's just bought a Delonghi Il Gelataio that I'm impressed with. If only I had an ice cream maker. This is looking just too pretty .. picture perfect! Emma: I will note that, can't wait to get my hands on a proper machine! sunshineandsmile: You don't need an ice cream maker, just freeze and beat every couple of hours if you don't have a machine. Chelle: I just got myself a popsicle mold recently. Haven't gotten around to that yet but I suspect it will be soon. Let me know if you have tips on a good ice cream machine. I'm a berry person! Must bookmark this!! I love the colour! Mrs Ergül: I must say I was pretty pleased how the color turned out, the secret is the lemon juice! It became bright pink after I added it, prior to that is was more purplish. Lisa: I'm looking at Cuisinart too, might just splurge on the self-fridging model. The ball was made using a large scoop, like the one in the last photo. I also have a 'scraping' scoop which is even bigger. This ice cream really scoops well! Lovely color on the ice-cream!! This is gorgeous Pick Yin! 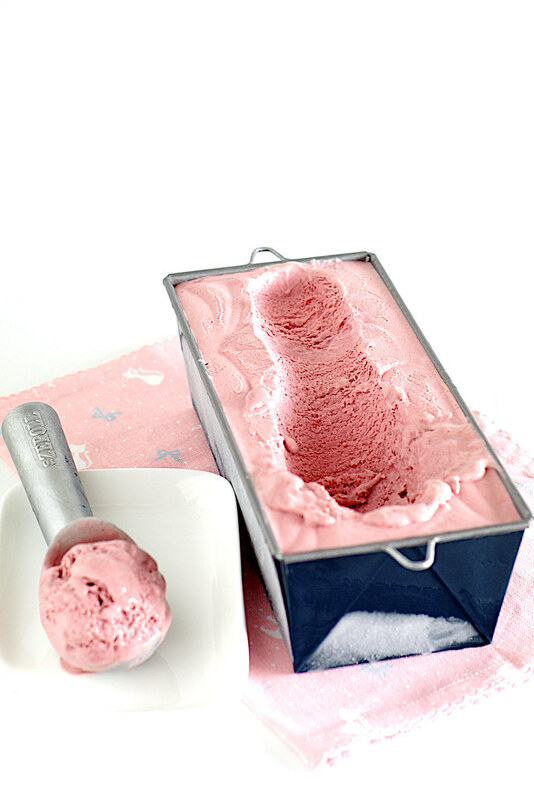 Love the beautiful rosy colour of the ice cream. Amazing photos! Anh and Sneh: Thanks ladies, the color actually came out better than I would expect! Ann: That's more than 2 weeks ago. The season is short this year. Even in Shanghai the lychees are no longer at their peak. Swee San: Here in Singapore I stopped seeing the baskets of lychees at Cold Storage since I came back this weekend. I guess the season is ending. We'll have to move on to cherries, Rainer ones are in the rage right now. I bought mine from ToTT not too long ago and loving it. If you want, I have the discount card for it. If not wrongly, it is retailing at 500+. 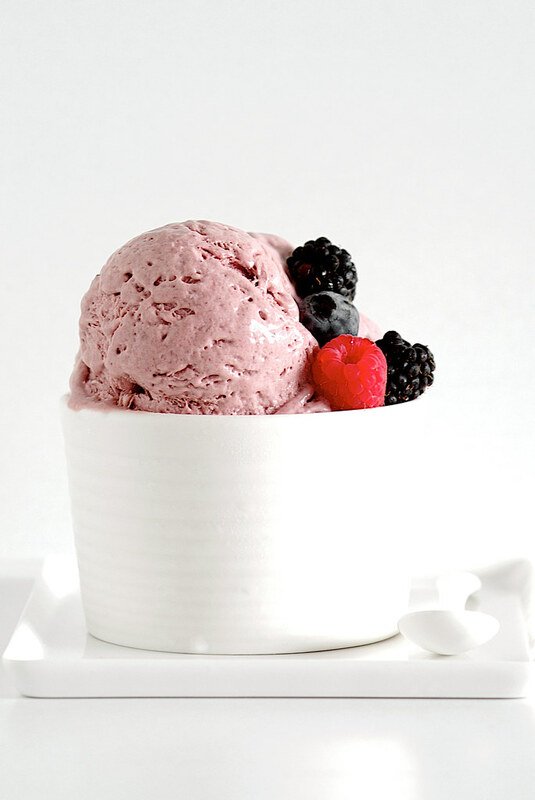 BTW, just adores your berries ice cream! yum. Edith: What brand is yours? I saw a self-fringing unit there but didn't get it because I've neve heard of the brand and they stopped selling Cuisinart. I am about to make your delicious ice cream here in Salt Lake City where we at 105 degrees right now!! So hopefully your ice cream will make us feel really cool ! The only recipe that I have found that I feel like giving it a try. Overstock.com has those KitcheAid ice makers but only for 110 watts.